“We’ve been on a rocket ship since 2010,” Philip Brown says of his four-year-old company, Perc Coffee, which began as a one-man micro roastery and bike delivery service. 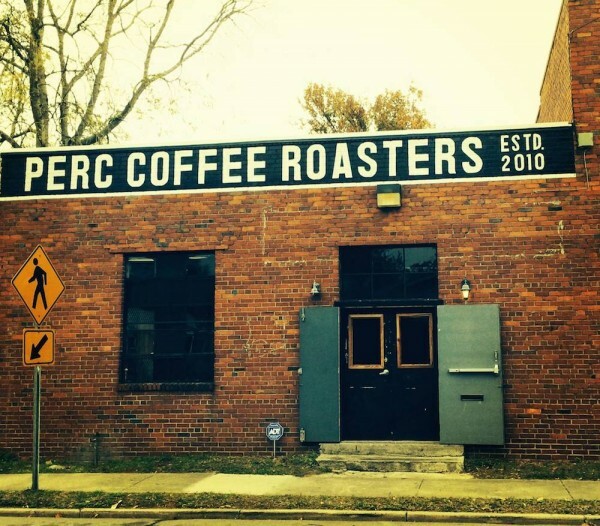 Now, with a staff of seven and a relatively new roastery space, the shadow of Perc’s ship has grown over dozens of quality cafes, restaurants and groceries throughout its home base, Savannah, to throughout Georgia and the U.S. Southeast. How would you characterize Perc’s growth over the past four years, and does it look like anything you might have imagined in 2010? We’ve grown in a couple of ways — lot of ways. Mostly we’ve made more relationships. I have more employees, more accounts, more importers, more sources of coffee, which all leads to better coffees and a customer base that’s appreciating better and better coffees. The growth has mostly just been faster than what I expected. We tend to be super super ambitious and take on a lot of projects, which is both awesome and stressful. We’ve had to test ourselves on what our limits are. Two years ago, Christmas time, I would go to work at eight o’clock in the morning, work until six at night, bike home for dinner with my family, bike back to work and work until midnight. That’s when my dad was like, “You need to hire people.” So I hired Spencer first, then Jared and later Taylor. With any small business, you just keep pushing to make things happen. Unlike school, you can’t just call in sick. You gotta show up. 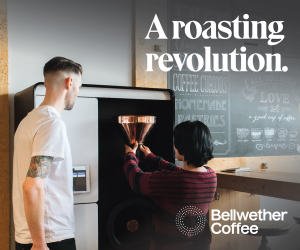 You’ve recently moved into a new roasting space? How has that affected operations? 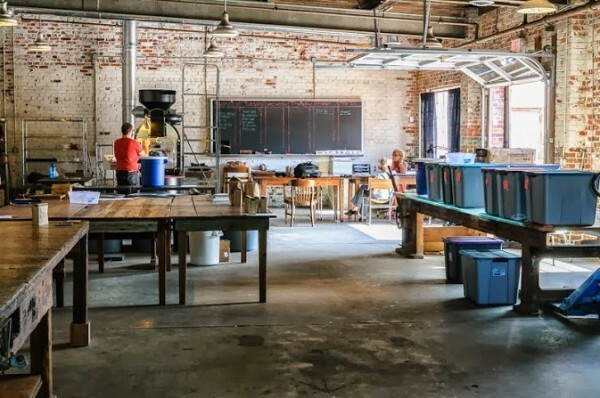 Last September, we moved into this badass industrial warehouse over on Savannah’s east side. We share a courtyard with the Southern Pine Company, a reclaimed wood place, so all our tables are made by them. It’s a big, high-ceilinged industrial building with open pipes and air shafts and lights and fans and beams on the ceiling, white brick walls, cement floors. It’s got this big, open, airy feel, and the best thing is the abundance of natural light coming in through the windows that look out on the courtyard. Actually, the very best thing is the stereo. We’ve got a record player and surround sound, so what more do you need? We recently built out a clean room for our cold brew production, with a walk-in refrigerator. Closest to the door is our training lab with all our brewing gear, Mahlkonig EK43 and Marzocco GB5 espresso machine and all that. That’s where Spencer and I cup every morning, and where we train accounts. The middle of the space is divided into an office/green bean storage/packaging line. When we moved into the bigger space I got a bigger roaster, too. It’s a Diedrich CR-25; we also have our old Diedrich IR-12 for backup. How do you approach a roast, either technically or philosophically? What are you looking to accomplish with each batch, and can you share any secrets as to how you get there? I have some fundamental ideas of how to approach the roast based off origin, but I know those ideas don’t always hold true. I also consider what I want to achieve with different process methods, altitude, etc. Obviously, samples tell us a lot too. So I have a couple different techniques based off of those factors that I use as a baseline. Then I roast an initial batch of coffee, and we’ll pull different samples of that coffee at different stages throughout the roast. With all my roasts I focus heavily on smelling and watching the coffee, and we use roasting software to keep track. Beyond that it’s just a lot of cupping. Based on cupping, I try to reconcile what it tastes like versus what I expected. Then I go back to the roaster and tweak accordingly to highlight the flavor better, tweaking the first crack or delta point. A lot of people focus on the end of the roast, but I focus more on first crack because that’s going to set the tone for the rest of the roast. It’s a lot like chess, where you have to be thinking a few steps ahead. I’ve been experimenting with different batch sizes based on what I’m trying to achieve with each coffee, like dialing in batch sizes for different coffees and charge temperature versus flame application, etc. Also, the CR-25 has an insanely awesome airflow and I’m able to do a lot with it. With the old one we had basically three positions for airflow but with this one you can stop at any point. I like sweet, clean, articulate coffee without even a touch of a caustic note in the back end. So I like lighter roasts. At the same time I like to develop sweetness. Being that we’re in the South, we’re constantly given this duality, the challenge and delight that we’re redefining what coffee tastes like for our customers. It’s awesome because we get to give them something different but on the downside we’re pushing people out of their comfort zones. What can you share about your approach to sourcing green coffee? We source coffees to fit a specific space in our portfolio. Also, we source with the seasons. We’ve made a real commitment to that in the last year to year-and-a-half. For example, right now we’re looking for a Kenyan, and we’ve already rejected fifteen samples. We’re usually looking for a combination of the most exciting coffees and specific flavor profiles to fit a hole in our portfolio so we contact virtually every source we know or have and try to get a few samples of coffees that might fit the bill. Working with the importers and constantly giving them feedback on what we’re cupping is important, so they get to know our tastes and the subtleties of what we like and don’t like and what we’re into. So when Colombian season comes up and they have 27 coffees to choose from they know which handful to point us to. We are just getting into buying coffee forward rather than on spot and our importers have been a huge help with that. A lot of people try to downplay the importance of the importer, but I feel a strong bond with my importers. They’re the connection between me and the farmer. At this point we’re really not able to go to origin, so that’s huge for us. Any future plans for a retail element? I guess the short answer is, I’m not sure. We do popups under the name of The Shop, and we do public cuppings every Friday at 11 to present coffee the way we want to and as educational events. Right now there are no imminent plans for a retail outlet under the name PERC, but we have floated around different concepts that would involve retail. For now, we’re really eager to partner with people who share similar values. I think there’s a special relationship that forms between a roaster and coffee shop that serves their coffee exclusively. We can be 100 percent committed to their success. We can train their staff, we can answer phone calls, we can discuss brew parameters all day long. It establishes this special connection where when they succeed, we succeed, and we’re basically partners. Let’s backtrack a bit. What first drew you into specialty coffee? After a while of working at [Jittery Joe’s] coffee shop in Athens, I enjoyed making milk-based and chatting with customers. Around that time, I got a hold of David Schomer’s videos and was really inspired. I got into milk theory, measuring doses and yields, and latte art. I also became intrigued by tasting different coffees from different places and realizing the importance of the coffee to those places. Charlie, our roaster, had this big book that broke down where different coffees came from and their economy and cultures and just everything about them, and whenever I had downtime I’d sit and read through it for hours. 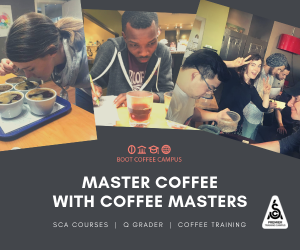 Service was always important to me and in order to provide good service, you need to know how to provide good coffee: Do it well and fast and don’t let it take over so much of your attention that you can’t interact with people. Every time I turned around, we were bringing in coffees from different places. I started learning more about geography and topography and cartography. Then later, after working at the coffee shop, I started working with Charlie [Mustard] at the roastery and that’s when the world really opened up to me. I learned from Charlie how to communicate about coffee, as well as how to roast it. One of the things he always used to say was you can have all the tools and everything else to roast coffee consistently but there’s no better way than to watch the bean and smell the bean and know what to do. If something happens and my timer doesn’t work, or the roast software quits, it doesn’t worry me at all. That’s something people learning how to roast now need to pay attention to. 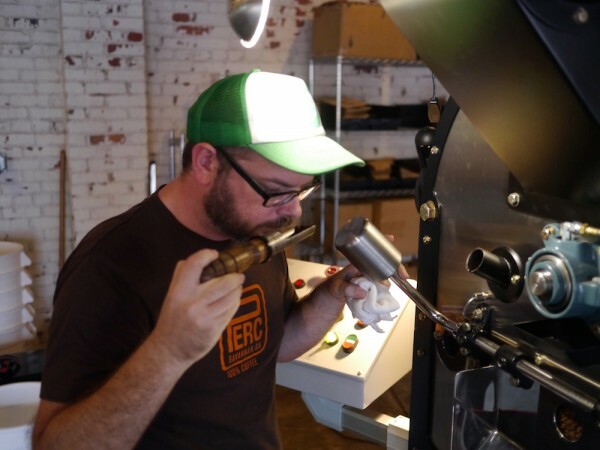 What are some of the specific technical challenges roasting in the South? you have to understand how the heat and humidity affect the roast. You need to know, if it’s cold weather outside, how that affects your green bean storage even in climate control, and how that affects your roast. Do you need to increase your batch size? Can you let your batches go a second or two longer since they might cool quicker due to the ambient room temperature? And vice versa in the heat. Are they gonna take longer to cool when it’s hot? Also, when it rains I’m starting to wonder about barometric pressure and roasting. When it’s raining and a high barometric pressure I think our roasts try to speed up a little bit. 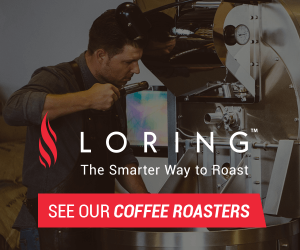 What is it about roasting, specifically, that appeals to you? That’s such a crazy question. Everything about roasting appeals to me. I love it. There are so many different factors to control, so many different things that can happen in a roast that affect something so complex already. You’re trying to take something that is wild and varied and make it the best it can possibly be. I always say everybody always has a different idea of what constitutes a great cup of coffee, and everybody’s right. That’s what’s hard. You might like a dark, smoky Italian roast and you’re not wrong. I think it tastes terrible, but that doesn’t mean you’re not right. So roasting makes it easier for me to have a point of view. I do my best to roast the coffee to taste exactly how I think that coffee should taste, at its best. I try my best to state my case to my customers and staff as to why I think that coffee is the right coffee to source and why that profile is the best profile to present. And then I’m skeptical. I’ve always had trouble focusing in my life, but for some reason when I’m roasting, everything else just disappears. 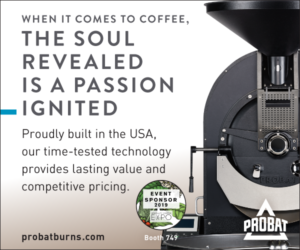 I can watch the same little bean swirl around in the roaster for thirteen minutes straight, and I can do that over and over again for seven hours. And if I do it well, we can make a cup of coffee that tastes great and people agree with me. There’s something so amazing about going to a shop that serves my coffee, and no one has any idea who I am or that I might be involved. 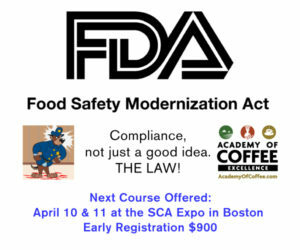 I can watch sixty or seventy people drinking my coffee, and they don’t need to worry about how complex the process is. All of that is over. If the baristas did their jobs right, and I did mine, then all these people can just sit around and enjoy life with a cup of coffee in their hands. What do you make of perceptions of specialty coffee in the South among the media, others in the industry, or even consumers? I’ve had people try our coffee and be surprised it’s so good or it’s got an elegant, bright acidity. It’s nice to hear they think our coffee’s great but it’s strange to see how surprised they are. I can name a ton of roasters down this way who are doing a great job, even just amazing roasters in this town. We cup a lot of coffees blind from a lot of the major roasters and I’m still pretty proud of the coffees we’re putting out. More troubling is the general sense, from people in the South, that because it’s made in the South it must not be as good as something from San Francisco or Portland. That’s just silly. Between here and Portland I can name tons of roasters who are as good as Stumptown — and Stumptown’s great. So what is happening in Savannah and farther afield in the Southeast? In Savannah, there is a small but passionate community of coffee people, a handful of great coffee shops, and James from Cup to Cup makes amazing stuff. There’s lots of good stuff happening in Charleston and Atlanta, lots of TNTs and big communities, and we hope to spread that in Savannah. Velo and Copacetic in Chattanooga, and Bold Bean in Jacksonville, are doing great things. And there’s 1000 Faces and Jittery Joe’s in Athens. We’re really excited about the southeast. 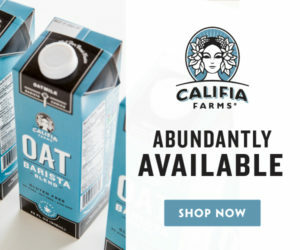 There’s probably a bigger market for our coffee in other places like New York or Chicago. But we chose to move here because we wanted to be part of a movement, something exciting and new for Savannah and the South. We wanted to bring great stuff to people who didn’t even know they wanted it — and now they’re enjoying it. I intentionally picked a place where the market wasn’t being met. To me, that was the exciting thing. I can give people here something different. I felt like Savannah was ripe for it. Wow! What a great interview. Thank you.